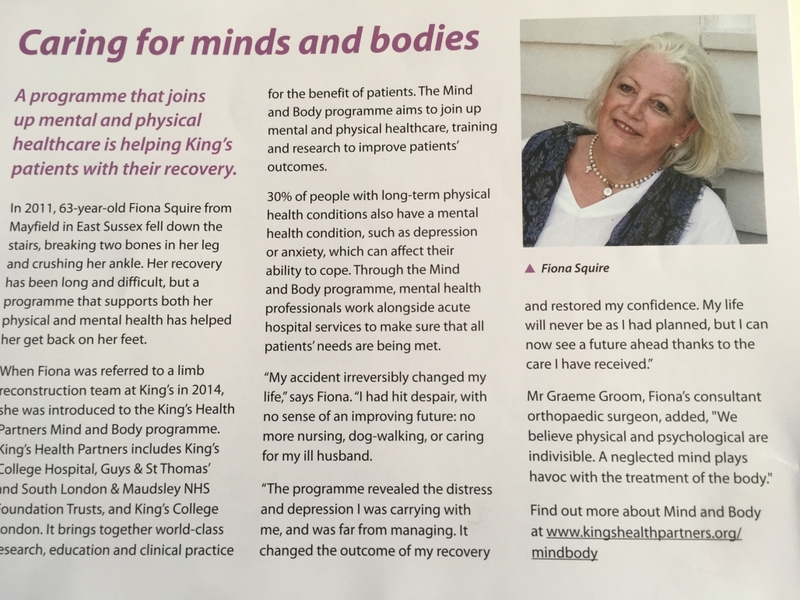 Fiona Squire, a former limb reconstruction patient, talks with @Kings magazine about how the Mind & Body Programme. My accident irreversibly changed my life. I had hit despair, with no sense of an improving future: no more nursing, dog-walking, or caring for my ill husband. The programme revealed the distress and depression I was carrying with me, and was far from managing. It changed the outcome of my recovery and restored my confidence. My life will never be as I had planned, but I can now see a future ahead, thanks to the care I have received. We believe physical and psychological are indivisible. A neglected mind plays havoc with the treatment of the body. Find out more about Mind and Body by clicking here.